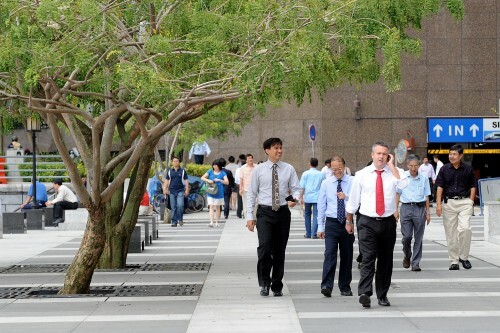 Four Singapore firms have been ranked among the leading companies worldwide for running environmentally and socially sensitive business operations. Keppel Land, StarHub, City Developments (CDL) and CapitaLand made it to the Global 100 Most Sustainable Corporations list announced yesterday at the World Economic Forum in Davos. The rankings, launched in 2005, looks at factors including energy, water and waste productivity as well as social responsibility. Keppel Land was ranked 17th, making it Asia's most sustainable firm. It was also the top-ranked real estate firm worldwide. Its pledge to reduce its carbon emissions, the use of solar panels in its developments and its commitment to good corporate governance all helped it score. Chief executive officer Ang Wee Gee said: "As environmental, social and governance issues dominate global agendas, we recognise that sustainability is no longer an option, but a necessity." StarHub, which leapt 37 spots to 29th from 66th last year, has instigated ways to allow consumers to recycle their electronic waste. CEO Tan Tong Hai said: "We are extremely happy, both to be listed alongside other champions of sustainability... as well as to have improved so markedly in such a rigorous ranking." CDL, which rose 13 notches to 39th, has been publishing a yearly sustainability report since 2008. Ms Esther An, its head for corporate social responsibility, said: "Since the mid-1990s, CDL has committed to the vision of conserving as we construct." Fellow developer CapitaLand, which climbed 19 spots to 58th, scored well for its board's high female representation and its green buildings, among other things. CEO Lim Ming Yan said: "Sustainability and financial performance work hand-in-hand to ensure the success of companies and CapitaLand's top management are committed to support sustainability initiatives."